Before I get the wrap of being one of “those” moms, you know… the ones being made fun of in the ecards on Facebook these days, I want you to realize something. Choosing to create something does NOT need to take all day. In fact, most of the projects I put on here, including my art pieces, were created in about 10-20 minutes per day. Yup. That is excluding prep time, as in buying stuff if I need it however. (I could get lost in an Arts and Crafts store for hours… ahhhhh.) But I digress. I will sketch some days. I will do projects with the kids some days. We will explore science some days. I will take photographs. I bake. I force my family to try new recipes. I will start an art journal page. I will finish that art page another day. I will paint a background or a foreground. On seriously low creative energy days, I may just only gesso (surface preparation) a canvas in hopes of being inspired or even glue together pages of a composition notebook so that my markers don’t bleed onto the next surface. My point is this… give yourself permission to accept all things creative in your life as such. Don’t pressure yourself to create a masterpiece or a science fair project with your kiddos every time you sit down with them and don’t feel the need to completely start and finish a project at every sitting. The biggest thing really… is to start. And finish period! The reason I say this is that sometimes I feel like a started background can haunt me. It sits and says… you had “this” project in mind for me… when are you going to do it? Huh? Huh? I feel like that nagging feeling, though it may be a creative one, can hinder me from cultivating my next idea. It becomes another thing on the “to do” list instead of being the inspiration it once was. I guess that’s why I love to sketch. I never ever thought I would utter those words, but my sketch journal has been a place for me to put down the ideas that come to me late at night as they often do. Why does that happen?! Anyway… By writing them down, I can then turn to them when I am ready to use them instead of letting them rattle around in my head taking up space. Let me tell you. With four kiddos, there is not a lot of space up there some days! Tapping into your creativity on demand takes practice. You need to stretch both sides of your brain in order to do so. You know what? So do your kids. And remember, I am not talking about complicated stuff. Color a page. Finger paint. Heck, even compare the amount of water 2 glasses can hold or do a contest on “what will float” in your kiddie pool or kitchen sink. Engage your brain in different ways every day… for if you don’t use it… you WILL lose it. 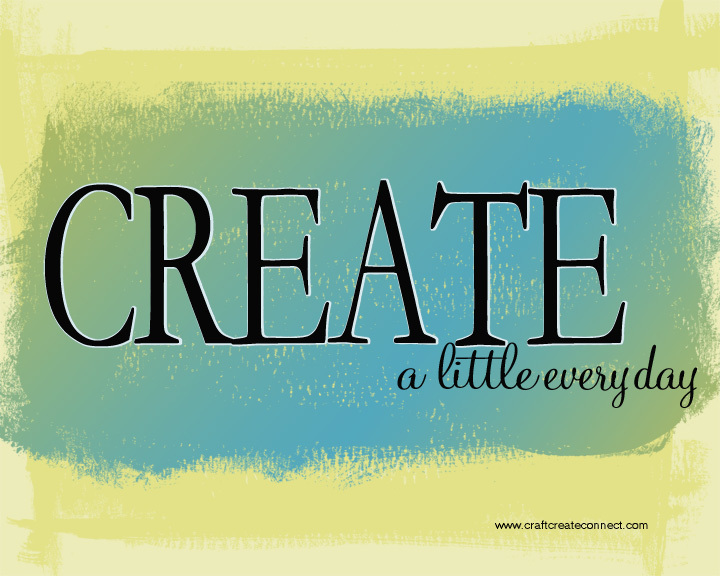 Now go create something wonderful! Thanks, I needed that !!!! must remember this …. must remember this …. must remember this …… 🙂 Great post, must remember …..
YAY! That’s quite honestly how I fell in love with mixed media. Each piece I create ends up being like a little mental puzzle :). Thanks for the comment!